Eksamensoplæg om Intercultural Competence (tema 4 - Litteratur, kultur og samfund). 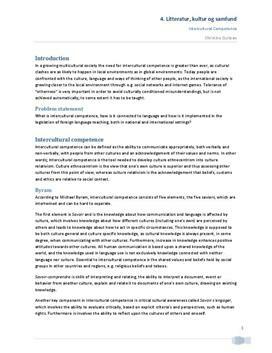 What is intercultural competence, how is it connected to language and how is it implemented in the legislation of foreign language teaching, both in national and international settings? In a growing multicultural society the need for intercultural competence is greater than ever, as cultural clashes are as likely to happen in local environments as in global environments. Today people are confronted with the culture, language and ways of thinking of other people, as the international society is growing closer to the local environment through e.g. social networks and internet games. Tolerance of “otherness” is very important in order to avoid culturally conditioned misunderstandings, but is not achieved automatically; to some extent it has to be taught. Intercultural competence can be defined as the ability to communicate appropriately, both verbally and non-verbally, with people from other cultures and an acknowledgement of their values and norms. In other words; Intercultural competence is the tool needed to develop culture ethnocentrism into culture relativism. Culture ethnocentrism is the view that one's own culture is superior and thus assessing other cultures from this point of view, whereas culture relativism is the acknowledgement that beliefs, customs and ethics are relative to social context. According to Michael Byram, intercultural competence consists of five elements, the five saviors, which are intertwined and can be hard to separate. Materialer relateret til Intercultural Competence eksamensoplæg.